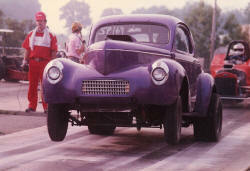 Max started racing in 1959 with a 1952 Mercury using Olds power. 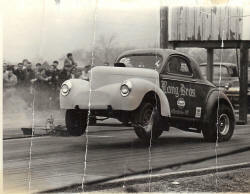 His next ride was a 1960 Chevy with a 348 that he ran in Stock. 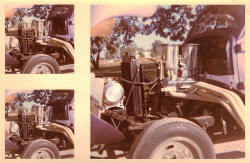 Finally in 1962 he bought the familiar 1940 Willy’s we all known today. It’s been said his Purple Willy’s has made more passes down CCD then any other car. The Willy’s was built by Harry Hurst and Max bought it from Ted Holmes. The first motor was a 346 Olds with a Lasalle Trans. 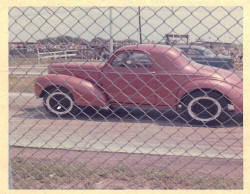 The rear wheels were handmade by Max and his father “Walter who also was his pit crew along with his mother Mildred. From 1966-1969 the Willy’s was red and ran under the name “Lang Bros. Gulf” and had a 350 SBC running in C/Gas which normally was under the National Index. 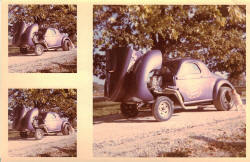 During the 70’s the Willy’s seemed to have major mechanical problems and was eventually repainted “Purple Metallic” and appropriately named “Double Trouble”. During the days when CCD closed its doors, the Willy's was put out to pasture as a fun weekend road car. Max and his son Mark took to the streets of Charleston showing it during Cruises. When CCD reopened its doors, Max got the need for speed again and the old Metallic Purple Double Trouble was given a new facelift as Eric Strandburgh worked his magic with the beautiful new Burgundy Rose color you see today. Max married Patty on July 5 1963 and they have 3 children (Teresa, Tammy & Mark) and 7 grandchildren (Adam, Chloe, Emily, Jamie, Payton, Ryan and Shawn). 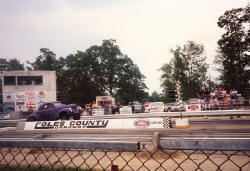 Max was voted into the Coles County Dragway USA Hall of Fame in 2009 and is still actively running his 1940 Willy's in the Pro Category. In the 2011 season Max had catastrophic engine failure during the first points race and contemplated giving up racing. Luckily he didn't because he had one of his best seasons, but missed 5 races. On 21 Aug Max was in 8th place 79 points down and ran off a string of Wins, R/ups and Final 4's to finish in 3rd place just a few races short of the Championship.